Home / Announcements / KeyTronic “Foam and Foil” Capacitive Pads are Back in Stock! 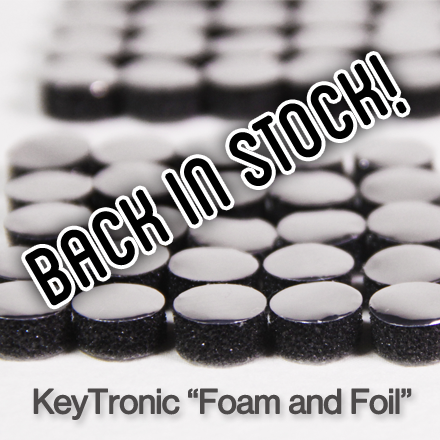 KeyTronic “Foam and Foil” Capacitive Pads are Back in Stock! I’ve got more “Foam and Foil” Capacitive Pads for KeyTronic Keyboards stocked now and they go fast! I am punching up more each day as well as getting more material ready to try avoid going out of stock again. The weather has been cutting into curing time as humidity can make this take a bit longer. Please rest assured I am doing what I can to stay in stock, hopefully I am ahead of the game now. However, if do you arrive at the store only to find they are gone again, just send me an email and I will personally contact you as soon as I have more listed again. Thank you for your patience!